In a small bowl, combine 2 tablespoons of salt and the pink curing salt and rub over the duck breasts. Cover and place in the refrigerator to cure, about 6 to 8 hours. Rinse away the salt from the breasts and place each in a sealable plastic bag along with 1 black garlic clove. Seal up the bag, taking care to remove as much air as possible. Preheat an oven to its lowest setting (usually between 160 and 200 degrees). On a small sheet tray lined with parchment paper, lay out the remaining black garlic cloves so they aren't touching. Bake until they are dry and crisp, about an hour. Transfer to a spice grinder and pulverize to a fine powder. Fill the insert of a slow cooker about half way with water and let it warm for about 1 hour on the low setting. Add the bags containing the duck breast. Cook for 40 minutes on low, flipping the bags over half way through cooking. Remove the duck breasts from the bag and place on a paper towel-lined plate at room temperature. In a medium-sized bowl, combine the citrus, onion, diced mango and chile. Season with salt, usually about about 1/2 teaspoon. If you like it a little sweeter, add about 1/2 teaspoon sugar. Heat a large (12-inch) skillet over medium high and film with oil or duck fat. When hot, add the duck breasts and sear, about two minutes per side. 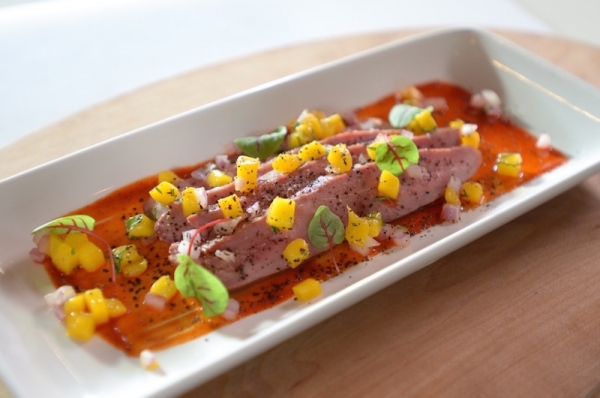 To serve, place the duck breasts on a large serving platter, sprinkle with the black garlic powder and garnish with mango salsa and cilantro. How do you make the cabbage and radish balls that were shown on this show? Please give the sous vide tmperature and time so I can prepare with my soya vide. Am I remembering correctly that you set it for 139.9 and cooked for 1 hour? Would live to make this recipe. Thank you!